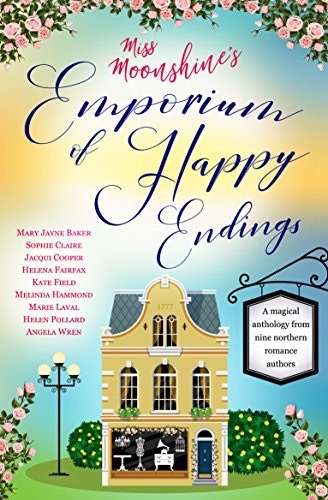 My review today is for new release Miss Moonshine’s Emporium of Happy Endings, an anthology of stories written by some of my favourite authors. I will admit now that being set in a small, fictional Yorkshire town, the link to France is rather tenuous; although France gets a few mentions, a Frenchman is featured once and one of the authors is French. However, having previously read, enjoyed and reviewed books from four out of the nine writers, I couldn’t pass up the opportunity to read this, and I’m so glad I did as it ticked all my boxes, and there was nothing I didn’t enjoy. Through the stories we meet different characters and visit Haven Bridge in different seasons and eras. People and businesses come and go, and fashions and trends change, all with the exception of the mysterious Miss Moonshine, her dog Napoleon and her Emporium of Happy Endings. Those who have lost their way in life are assured of a warm welcome and some sage advice. In a funny way she seems to know what your problems are, even before you do. Despite being written by different people and focusing on different issues, there was a seamless transition from one story to the next and it was remarkable how well each story complimented the others. I’m not sure whose idea this project was, but it was genius and it would be a real shame if this was their only collaboration. It was a moment of perfect escapism, that took me into a cozy world where a little bit of Miss Moonshine’s magic never ceased to give me a warm feeling inside and make me smile. In my opinion it is worth a lot more than the current 99p kindle UK price. Miss Moonshine’s Emporium of Happy Endings would be a great travel companion this summer and is available in ebook and paperback formats, links to Amazon can be found below.